As a working photographer, it’s great to work alongside an organisation doing great things, with great people, and to be able to help them tell their story. I had the opportunity a while back to become the photographer for the Heart of Kent Hospice. I make no charge for this work, which can be very varied in scope and occasionally quite challenging. This page of my web site includes just a few of the pieces of work I’ve done wearing my Hospice hat, badge, t-shirt or hi-viz jacket. It concentrates mostly on the big fund-raising events the very capable and busy Events team at the Hospice arrange. However, the scope of the 40 or so pieces of work I do for the Hospice each year is much more varied than this. It’s just that it wouldn’t always be appropriate to put them all on this site. It surprises many people to learn that Hospices are almost totally funded by contributions. They’re not part of the NHS or anything. I don’t make a charge for any of the photos I take at the Hospice fundraising events, but if you want to download a photo from one of them from the selection below, please consider making a contribution, no matter how small, to the Hospice. The photos from the 2k Fun Run that evening are also here. The first time this event has run. It was superb. Don't miss the next one! Just a small gallery of shots taken at the start and finish area. It wasn't my job to be out on the course on this occasion. 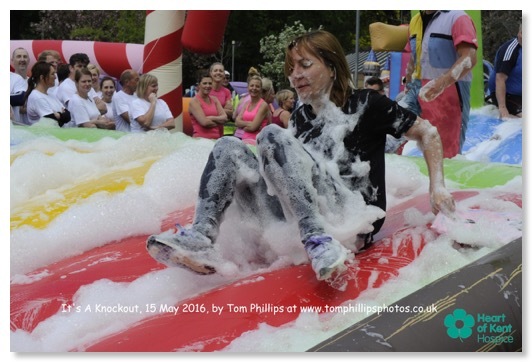 There have been four very messy Hospice Rainbow Runs, all held in Mote Park, Maidstone. From this link, you can see the photos from the events in 2014, 2015 and 2016, as well as the most recent pictures, from the event on 14 May 2017. The events held in 2016 and 2017 were hugely successful. They are covered by my photos here.